This textbook is an accessible overview of the broad field of organic electrochemistry, covering the fundamentals and applications of contemporary organic electrochemistry. 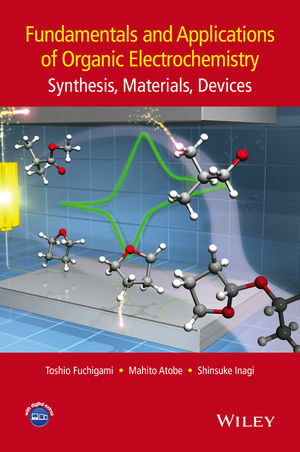 The book begins with an introduction to the fundamental aspects of electrode electron transfer and methods for the electrochemical measurement of organic molecules. It then goes on to discuss organic electrosynthesis of molecules and macromolecules, including detailed experimental information for the electrochemical synthesis of organic compounds and conducting polymers. Later chapters highlight new methodology for organic electrochemical synthesis, for example electrolysis in ionic liquids, the application to organic electronic devices such as solar cells and LEDs, and examples of commercialized organic electrode processes. Appendices present useful supplementary information including experimental examples of organic electrosynthesis, and tables of physical data (redox potentials of various organic solvents and organic compounds and physical properties of various organic solvents). Toshio Fuchigami has made outstanding and remarkable contributions to the field of synthetic organic electrochemistry over the past 35 years. By using fluorine as a key element and employing mediators, he developed new organic electrosynthesis methods for heteroatom compounds containing sulfur, nitrogen, iodine, silicon, and boron atoms. Furthermore, he developed methods for volatile organic compound (VOC) free organic electrosynthesis in ionic liquids. Dr Fuchigami has published over 300 technical papers, 54 review articles, and 44 book chapters. He has organized numerous symposia at Electrochemical Society (ECS) meetings and he currently serves as an officer of the ECS Organic & Biological Electrochemistry Division and the ECS Japan Section. He has served as Editor-in-Chief of Electrochemistry (Japan) and as an Associate Editor of the Bulletin of the Chemical Society of Japan. He also has served on the editorial boards of the Journal of Synthetic Organic Chemistry of Japan and the Journal of Oleo Science (Japan). He is a recipient of the Takeda Award for International Achievement (2006), the Excellent Papers Award of The Electrochemical Society of Japan (2007), The Electrochemical Society of Japan Award (2008), ECS Manuel M. Baizer Award (2010), and Kato Memorial Award (2011). He became an ECS Fellow in 2010.